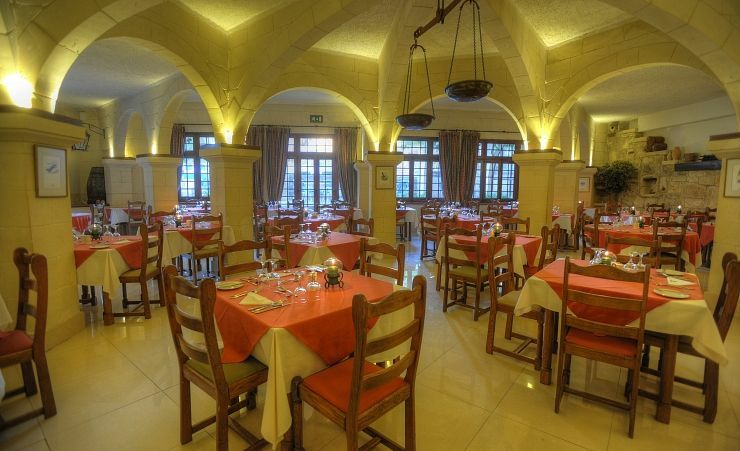 A stay at the charming four star Cornucopia Hotel, set on a high ridge, overlooking the rich, fertile Gozo valleys and out to Marsalforn Bay, is one of the best ways to really get in touch with these 'real' and unspoilt islands. 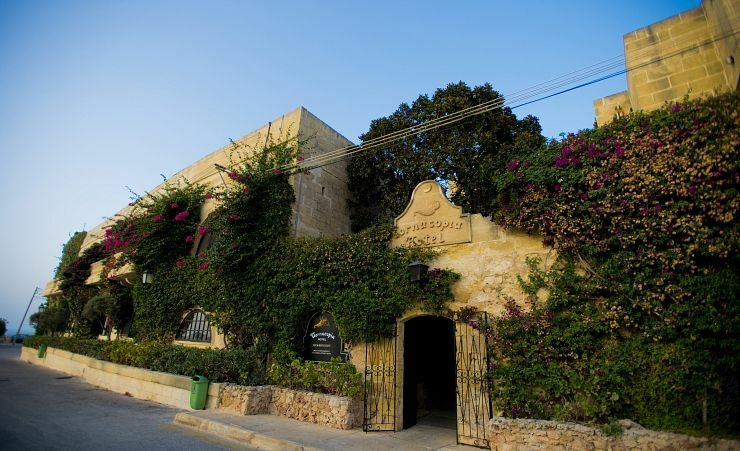 The Cornucopia Hotel is set in the village of Xaghra, a charming and fascinating spot, and steeped in the culture and history of the island. Ramla Bay is also nearby – a popular tourist destination thanks to its sandy beach – one of the few on the islands. 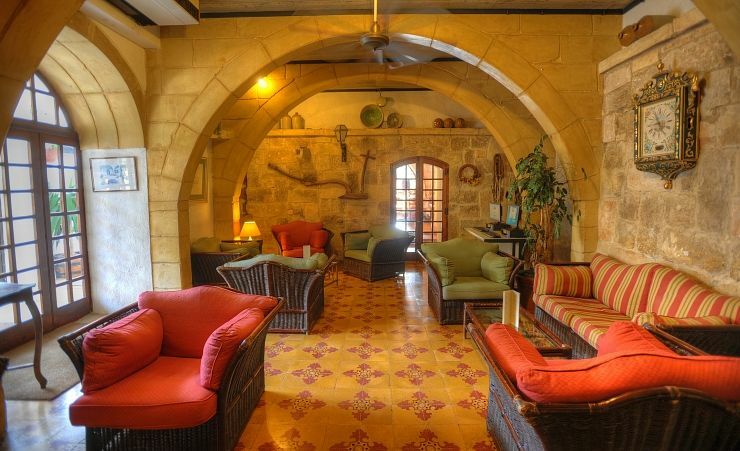 Beautifully converted from an old farmhouse, the Cornucopia Hotel is one of Gozo's most characterful locations. Behind the rustic exterior is a hotel of rare quality; there is certainly nothing rustic about the accommodation. You'll marvel at the superb restaurant with its vaulted roof, fall in love with its courtyard swimming pool and want to sit for hours admiring the wide open views from your balcony. The Cornucopia Hotel is set up for your comfort and enjoyment. With a smaller capacity than many of the hotels on the islands, it has a very homely feel to it. It's more than just a base for your Maltese adventures; it's a genuine home away from home, albeit with all sorts of luxurious add-ons! 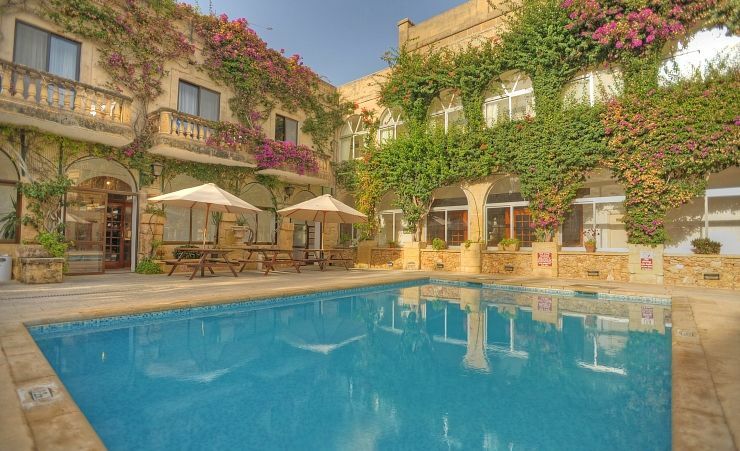 Take your pick of the two pools on offer, enjoy a lazy afternoon or long evening at the terrace bar overlooking the Gozo valleys or spend some quiet moments enjoying the picturesque gardens, the Cornucopia Hotel really lives up to its name. 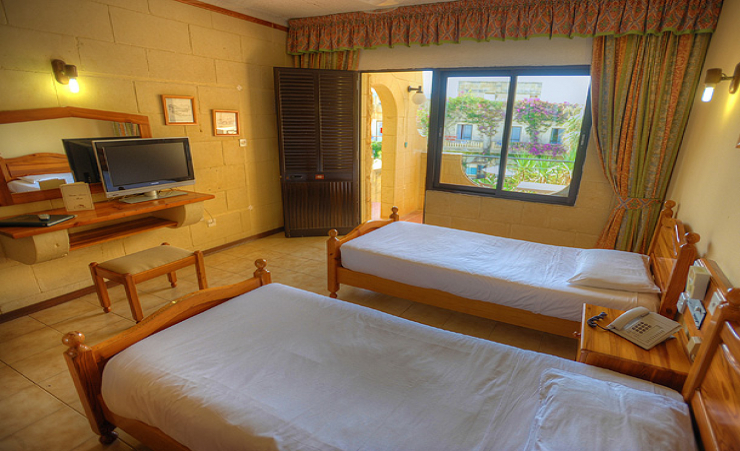 Twin and double rooms are available, all air-conditioned/heated and boasting their own private balcony. There is even a wonderful honeymoon suite, complete with its own Jacuzzi. Holidaymakers looking for a rich assortment of activities and opportunities to explore will love Xaghra and the Cornucopia Hotel. With its expansive views, unspoilt villages and fascinating harbours, it is a rich melting pot, steeped in the unique character of these wonderful islands. Find out more about your accommodation and the in room facilities at the Cornucopia Hotel . 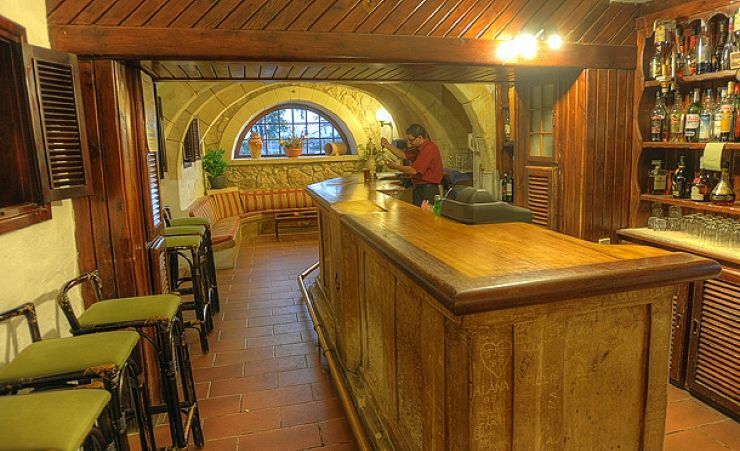 The Cornucopia has 20 standard rooms all furnished in the characteristic rustic style typical of the hotel. The rooms are most comfortable and decorated in warm Mediterranean style with natural wood furniture and pleasingly cool tiled floors. Overlooking green valleys and green pastures, Xaghra is one of the earliest inhabited areas of Gozo, which makes it rich in cultural heritage and history. This lovely inland village has an attractive and busy square at its centre, populated with traditional bars and newer restaurants. We have stayed at this hotel many times, and always get a warm welcome. The Cornucopia never seems to lose it's charm. Fourth visit and every bit as good as our first. Hope to return December 2019. Delighted you have added private transfer between Malta and Gozo. Good standards throughout. Got exactly what we were expecting. Always get exactly what we pay for with Mercury. No complaints at all! Very friendly helpful staff, excellent pre booked taxi services. Will go back again next year - could not fault anything. Great Bbq night on Friday- half board was excellent food all at reasonable prices! This is a gem, a perfect place for a relaxing peaceful holiday. The staff cannot be more helpful and obliging. Excellent service,food,facilities,hotel .Couldn't ask for better ! Excellent hotel! Had a wonderful 3 weeks. All the staff were so friendly and helpful. Beautiful location. The food was extremely good and plenty of it. The general manager Brian was absolutely brilliant nothing was to much trouble. The rooms were very comfortable, plenty of hot water. We have never slept in such comfortable hotel beds before. The private taxi transfers were excellent well worth having. Will be going back again definitely. We were very happy with the hotel. Excellent staff and the chef went out of his way to provede excellent vegetarian meals for my husband. Lovely hotel with helpful, friendly, reception, restaurant & bar staff, nothing was too much trouble. Reception, dining & bar accommodation with great architectural features & super table service from polite friendly staff. Our room was a good size with a lovely panoramic view right across the valley to Victoria. "All in All", lovely break in a super hotel with friendly staff. The Cornucopia is truly an excellent hotel. We arranged a Valley View room directly with the hotel. It was well worth the supplemental charge. I would recommend that Mercury offer this option in the brochure. Excellent small family run hotel, with 3 pools. We've stayed here before & love it. The staff & everything about it is top rate. Perhaps some more info on places to go should be available although we hired a car & just poodled around so found some lovely places ourselves. A most beautiful and unique restored farm house full of character giving it a feeling of olde world charm. The staff were friendly and always addressed any problems immediately for example the weather for the was appalling, extremely cold, biting winds, torrential rain at times, thunder and lightening and hail stones! On request we were given a radiator for our room and extra duvet - made a massive difference! Daily cleaning of room and hotel was to a very high standard, food and service was excellent. Very friendly, warm, with character, very relaxing with beautiful view. All in all a good holiday with good weather can't wait to return. Most likeable hotel I have stayed at with best management and staff. This Hotel should be 5* nothing is a trouble to them. Food/service/everything is amazing. It's a beautiful hotel with excellent swimming pools.The location is so peaceful and relaxing, you really feel you have had a wonderful holiday..and we certainly did. Thank you to all at Cornucopia. We will return. Mercury have always given good service and excellent prices.and always recommend Mercury Holidays. All the staff at the hotel were very helpful, it was a lovely relaxing stay and I may consider another trip in the future . Second visit to hotel. Brian the Manager and his friendly and efficient staff work tirelessly to ensure everyone has a great time. Accommodation, food and ambience all very good. Hope to return again in future. Brilliant hotel and really appreciated that I asked for a quiet room and got exactly that, thanks ! Friendly staff,always there to help. Great hotel in a quiet location. Very good hotel with fantastic views. Some wind noise because of the location on a hill. Hotel was excellent and staff amazing and so helpful. Downside is that the standard rooms are now very tired and outdated. atmosphere and the helpful staff suited me very well! We were very pleased with this hotel. The staff were very friendly and helpful. We upgraded to a Junior Suite which was well worth the extra as it made our holiday that bit more special. The Hotel was very quite but we expected that given the time of year. the Carvery night was very good with lovely food and entertainment.